Our bedroom corner also serves as a makeshift desk. I can't say that it's completely finished as I'd like to figure out some sort of board or cork maybe to hold loose papers. Our printer also needs a home but I want something discreet because printers are not all that attractive and seeing it set out makes me feel the corner is an instant mess. 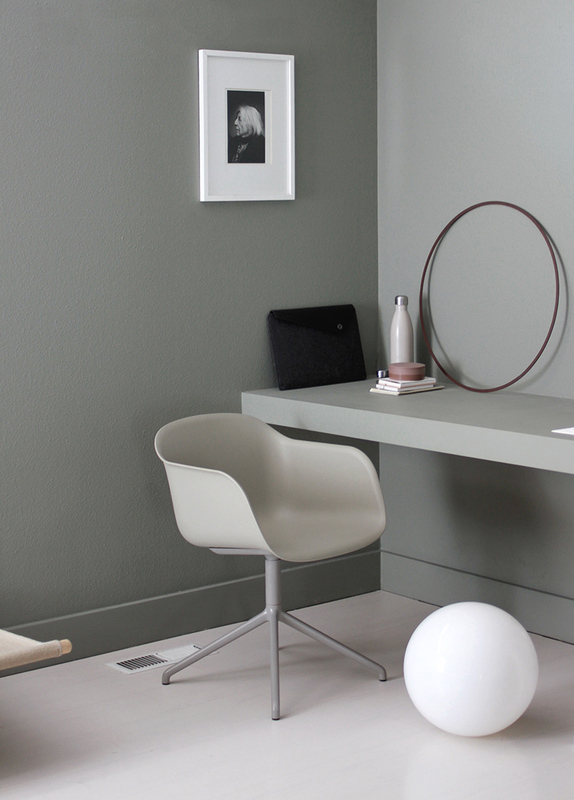 The chair though is my favorite part, Muuto's Fiber armchair with a swivel base is comfortable and happens to be very tonal against the similar green/grey walls. Currently my water bottle, stacks of notebooks for jotting down ideas or small sketches and Menu's Still wall geometry rest in the corner though that is bound to change as this surface is in a perpetual state or change. We have The same chair and I adore it! Ergonomic and beautiful. Your space is just perfect. Love the tones. So beautiful. I am agree with you about det printer. Its best to find å discreet place. Tell about it, when you find it. Beautiful picture.